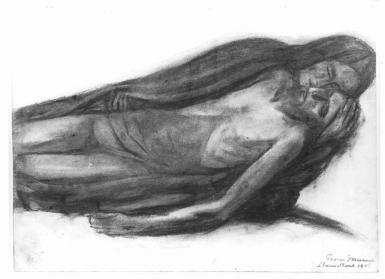 During the war years that Minne spent in Wales as an exile, an extended series of completed sketches emerges, primarily in charcoal on paper. The drawings vary in size, from small format to monumental drawings, up to two and a half metres high even. 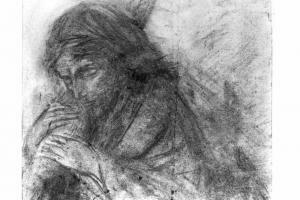 A few times the artist works directly with charcoal on canvas. What is distinguishing for Minne's drawings from this period are the soft, often muted execution of lines, the pictorial drawing style with an emphasis on the texture and the frequently affected, complicated poses. The thematic of the drawings is limited: mothers who embrace their children, women waiting, youths, Pietàs and Eucharistic Christ figures. 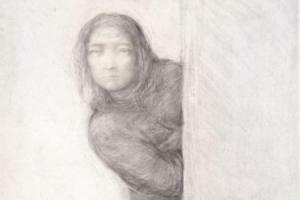 A subject that often comes about is that of the woman waiting, isolated and often half-hidden behind a door or a wall, as she looks at the viewer with an uncertain gaze. Most likely the drawings of a woman waiting have an autobiographical grounding, and the could be brought into connection with the uncertainty of Minne and his wife over the fate of their three sons, George, Paul and Marc on the Belgian front. 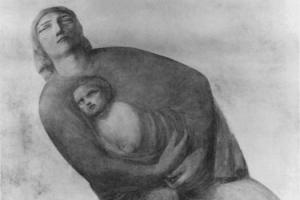 The vast majority of Minne's drawings from the war period have a mother and child as the theme. In essence, they are variations on the presentation of Mary with Child and of the Pietà, themes that have been known a long tradition since the Middle Ages in Western painting and sculpture. Minne places the biblical theme, however, in a broader context. In his vision the image of a mother and child form a pre-figuration of life whereby emotions such as birth, tenderness, protection, pain and death determine the path of life. The figures are primarily types, which strip away any sort of individuality. In contradistinction to before, Minne now, during his exile, grounded himself literally on biblical themes. 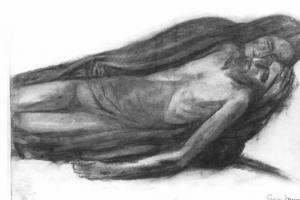 Thus are there some forty drawings known that have Christ as the subject and for the most part have to do with the Passion of Christ: the bearing of the Cross, the Crucifixion, the internment and the Eucharistic Christ.